Stir together flour and brown sugar. 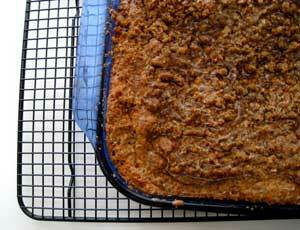 Use a pastry blender to cut in the peanut butter and butter until mixture is damp and sticky, like wet breadcrumbs. Set aside. In a large bowl, mix the cake ingredients. Beat these with mixer on high speed for three minutes, scraping bowl frequently. Grease a 13 inch X 9 inch X 2 inch baking pan. Pour mixture into it. Sprinkle topping mix over the top. Bake at 375 degrees for about thirty minutes; test with toothpick to see if done. Don't panic if it smells a little burned. It's the sugar topping. This cake is much better the second day. It's good the first but excellent after it's had a chance to sit (covered, of course) at least 24 hours. Copyright © 2009, Stacia Kane. All Rights Reserved.